Disclosing the terms and conditions of BT’s £425m Superfast Cymru contract with the Welsh government would prejudice BT’s competitive position and create expectations that, if not met, would hurt BT’s reputation and share price, says the head of Wales’ ICT Infrastructure Delivery, Simon Jones. 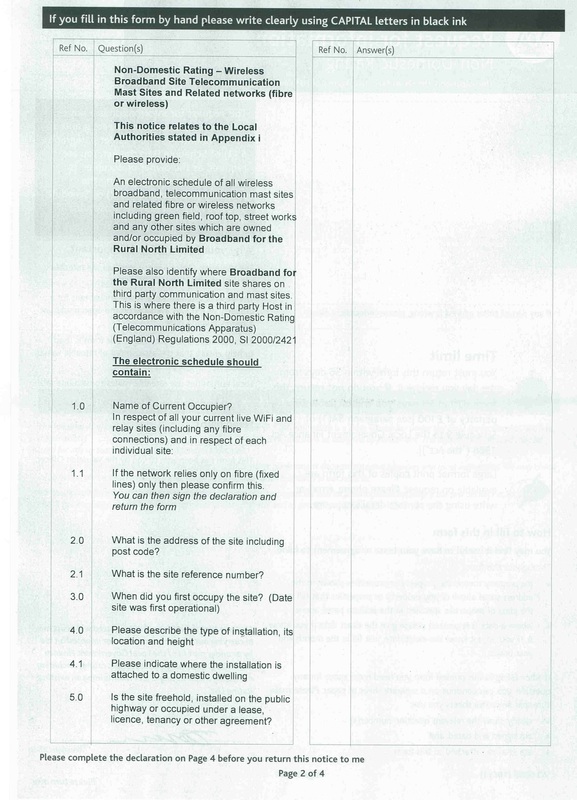 Jones was responding to a complaint to the Information Commissioner’s Office under the Freedom of Information Act (FOIA) from Richard Brown, director of Wispa, a Welsh broadband consultancy. Brown had earlier been refused any information related to the contract, the biggest and most expensive single next generation broadband project in the UK. Jones put forward various reasons for not disclosing the above information. “Releasing information on the location of sites and hosting protocols for internet websites would be likely to make the network vulnerable to e-crime,” he said. But this had to be balanced against the potential harm of releasing it. “The release of exact locations of infrastructure deployed would likely increase the risk of theft and/or criminal damage to the network. There have previously been a number of attempted thefts of network assets, with one attack breaching the security in one location. There have also been acts of criminal damage on several locations in the past which were investigated by North Wales Police. This resulted in significant coststo repair the damage caused. Release of information on asset locations would be likely to increase the risk of further attacks. 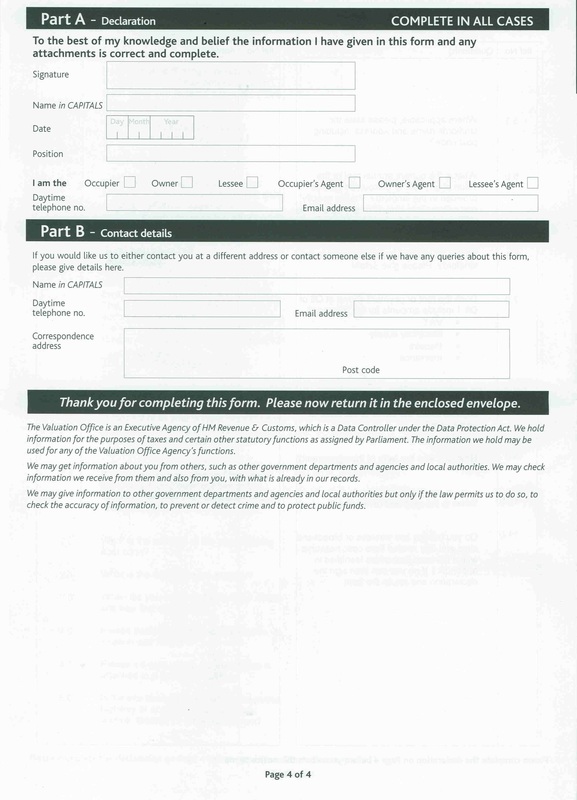 Turning to the confidentiality aspect, Jones said the information was protected by Section 41 of the act. Jones went on to say that releasing the details would be prejudicial to BT’s commercial interests because it could be used by competitors. “BT is still actively competing with other companies to win similar business. There is a pipeline of opportunities currently available for BT to bid for in order to provide similar services to other public authorities. Additionally, some of the redacted information, if disclosed, would reveal BT’s strategy for products that are not yet launched. Jones said the public has a right to know that the Welsh government is investing public money wisely, and that the award of public sector contracts is fair and within the rules. But he believed the public is interested only in the “wider detail of the contract rather than the detailed financial and operational information”. Jones said that suppliers might be put off selling to the Welsh government if the details of their proposals came out. If one accepts this view, then one must also accept that BT’s competitors are entitled to the same protection. This is not the case. In May BDUK, which is overseeing the broadband delivery programme, issued guidance to local authorities who are considering applications from community network operators or altnets for funding to cover the “Final 10%”. These guidelines state plainly that the supplier who wins the main contract under the BDUK procurement framework has a right to scrutinise proposed projects to assess their impact on the main roll-out. So far, only BT has won any such contracts, and Fujitsu Telecom, the only other eligible supplier, has long since withdrawn from the market. One might argue that the Superfast Cymru contract is a different beast from the average BDUK county procurement. True, but that is sophistry. BT’s network does not stop at the border; nor do its business practices. 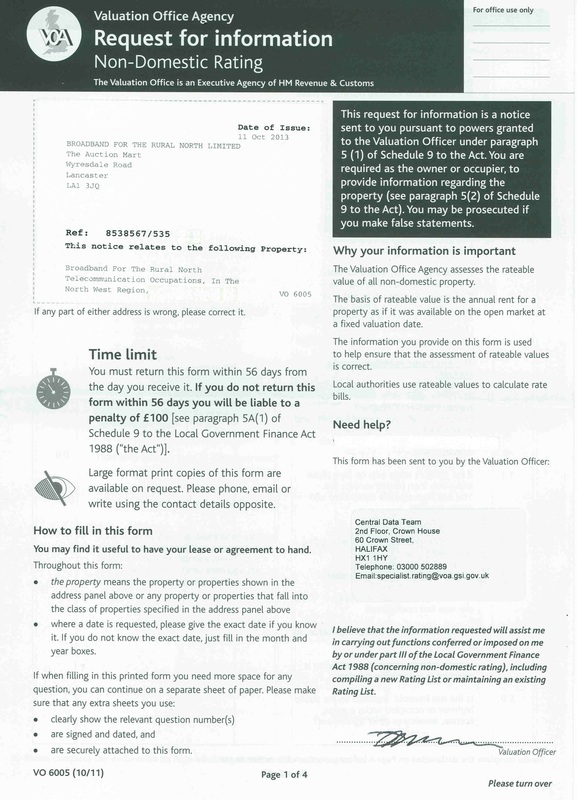 According to the guidelines, if an altnet proposal partially covers premises in the “90%” then the altnet, the Local Authority, DEFRA and BDUK have to establish if the BT project can be “re-scoped” to cover other areas defined as “no-build” in the SCT (Speed and Coverage Template that the LA agrees with BT). The LA, “at its sole discretion”, can ask BT via a “change request” to include the altnet’s proposed coverage footprint in the main roll-out. If the LA decides not to raise a change request, then the altnet can go ahead only “where it can be clearly established that premises are eligible premises for funding under the RCBF”. But the information it needs to do that is protected by the non-disclosure agreement between the LA and BT, and, according to Jones, by S41 of the FOIA. If the LA goes ahead with a change request, it has to ask BT to assess the impact of taking the altnet’s coverage footprint out of the main contract. To do this, BT would need to know precisely where and when and what its would-be competitor plans to build, without disclosing its own plans. You might think that gives BT an unfair competitive advantage; we could not possibly say. 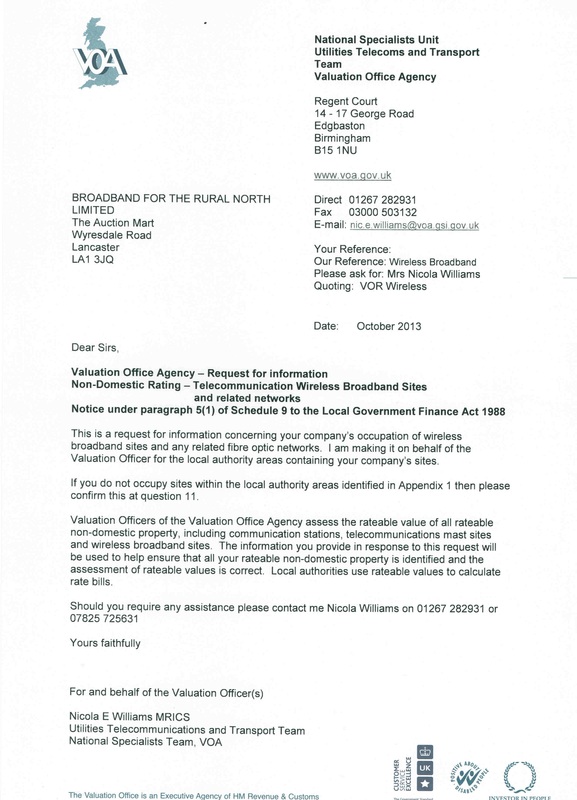 The Valuation Office Agency, which is responsible for valuing non-domestic property for business rates purposes, has written to network operators asking for details about their “occupation” of wireless broadband and fibre networks. Operators already pay business rates taxes on sites and masts used for mobile networks and microwave backhaul ; this is a long-expected attempt to subject fixed wireless broadband networks’ passive components to business rates taxes. Previous attempts have foundered because of a dearth of information available to the VOA. The covering letter and forms are available . A next generation broadband service will be acceptable as long as it “feels” like 15Mbps, according to BDUK, the government agency responsible for spending £1.2bn with BT to procure NGA. 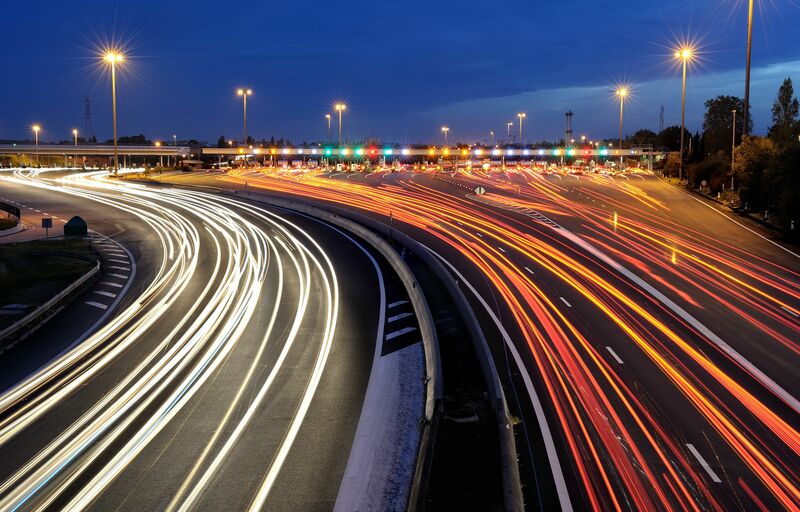 This emerged from correspondence following the BDUK industry day meeting last Monday to gather ideas on how to get high speed broadband into the Final 10% of the country. It is confirmed by presentations at the meeting. The EU target for next generation broadband is a 30Mbps universal service. BDUK has watered this down to 24Mbps and not universal. However, BDUK now says the service need deliver only 15Mbps “90% of the time”. A delegate writes, “I specifically questioned the panel about the detail of this as did another audience member. We asked what the exact criteria were and how BDUK would actually assess and measure/calibrate this – what does it actually mean? “I pointed out that for example BT allocates a maximum of 1Gbps supply to a 150 line Infinity module. Therefore if all 150 users were online simultaneously they could not get more than 7Mbps each – so how does this relate to users getting 15 Mbps for 90% of the time? “The panel could not answer, which was surprising and disappointing. The chairman of the day actually stated to the room, ‘Well, as long as it FEELS LIKE a 15Mbps connection it would be fine’. The meeting learned that any applicable technology would have to demonstrate a theoretical capability to deliver 30Mbps but that there was only a requirement for customers to get 24Mbps to qualify as the service being NGA/Superfast. “In other words, if you had a technology that could deliver (a maximum of) 25Mbps and not a bit more, then even if it could deliver 24Mbps 100% of the time to 100% of users on a ‘pure’ and uncontended basis, it would not comply technically with BDUK as it had no potential to offer 30Mbps. “This is more than a little confusing but I think I get what they are trying to say,” says the delegate. According to him, delegates wanted a new open market review (OMR) for the Final 10%. He notes note no agreements where made, no suggestions adopted and no policies changed at this meeting. The reader went on, “The exact speed and coverage predictions and templates are not being disclosed to the public due to NDA agreements put in place by BT with local authorities. Our reader says he and several other delegates believe BDUK may use this to give everything to BT again. “After all, if BT are the only ones that know the scope and speed and coverage for the existing projects, then only BT will be in a position to be able to scope out, identify and present a project for the Final 10%. So, what was that about, the well-unpublicised BDUK meeting to get fresh ideas about how to tackle the roll-out of broadband in the Final 10%? As someone said yesterday, the resulting silence has been deafening. Which must be music to BT’s ears, seeing that it attended but didn’t care to share its ideas, not even the Build and Benefit nonsense it was peddling via consultants Analysys Mason ahead of the Conservative Party conference. Malcolm Corbett, who speaks for the altnets under the INCA banner, says there was talk of alternative funding models. He believes the civil servants, ever keen to minimise their risk, prefer Option 2 with its gap-funded grants. Altnets and some local authorities generally prefer a funding scheme that would lower their cost of capital, and probably require less cash than the 90% BT seems to need to build in the Final 10%. Corbett has been offered a follow-up meeting because so much was were left unclear, such as what is “superfast”? In this neck of the woods, it appears 15Mbps may be it. Build deadlines were also undefined, so broadband-deprived farmers and pub landlords might have to wait until the existing roll-out is complete before work starts on their patch. What has happened to the £500,000 “Community Broadband Fund” that County announced at the start of their project? 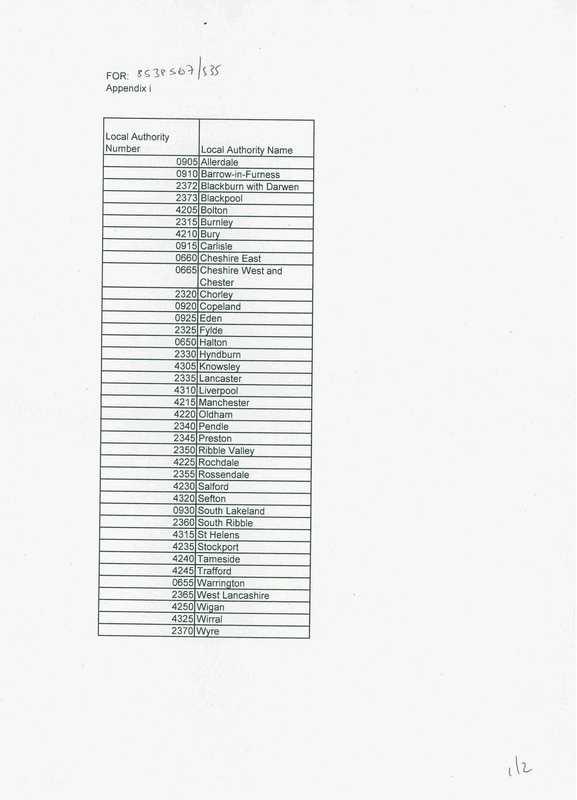 Why were the recommendation and specification submitted to County by City subsequently changed and who did it? “That the County Council be requested to re-affirm that Lancaster rural is the pilot of the project and will be undertaken first. That the County Council be requested to re-affirm that Lancaster rural is the pilot of the project and will be undertaken first.” There’s no evidence that this is happening. Has BT/LCC now supplied City with full coverage maps and postcodes and details of how SFBB will be delivered? What happened to the community meeting that (assistant CEO) Eddie Sutton promised the City Council back in July 2012? The committee may want to question LCC/BT about the recent reports which suggested that BT had confirmed to residents of Dolphinholme that they would be deploying a full fibre service as their traditional fibre/copper service would not be adequate, coincidentally shortly after the community there had started to deploy the B4RN service. BT have now installed a two new broadband cabinets in Caton & Brookhouse. The committee may want to ask BT/LCC what the maximum capacity of these cabinets are, given the models installed have a maximum capacity of 256 lines (they may even be 128). Caton has 1400 properties served by the exchange so this means that what is being deployed may not serve all that need it. This has happened elsewhere in the country so the City Council need to be assured that this will not happen here. There are also many lines in Caton served directly from the exchange so you might want to ask what is happening to these properties. So many questions; so few answers, but you get the picture. A job well done. (Ltr) BT’s Bill Murphy, MP Rory Stewart, and Cumbria County councillor Elizabeth Mallinson signing the £40m contact for the county’s next generation broadband roll-out, minus 7%. Perhaps it originally planned to hold the meeting in a BT telephone booth, but the department of culture, media & sport (DCMS), has rethought its venue to seek ideas on how best to get broadband to the Final 10% of UK homes. 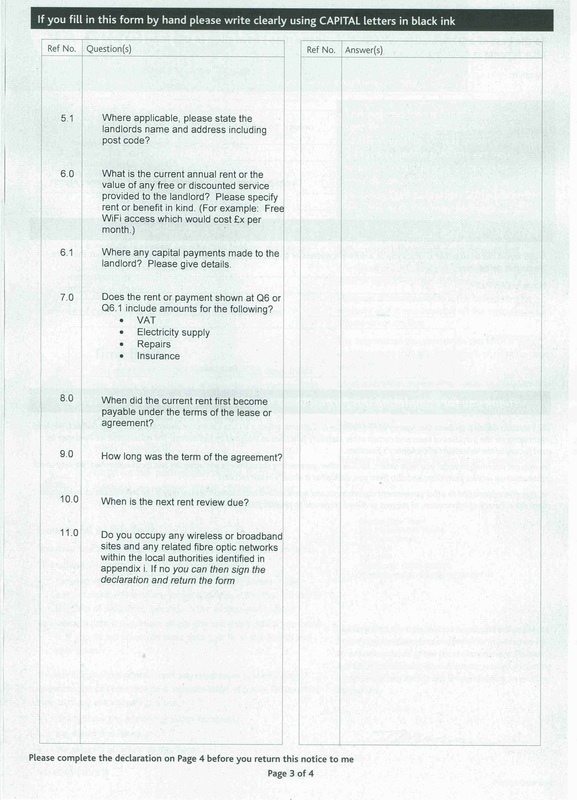 As this issue has been debated since the first broadband roll-out started in 2000, it is likely the real purpose of the meeting is to terrify and confuse altnets and local authorities about the risks, restrictions and complexities around state aid, and to create enough fear, uncertainty and doubt that BT gets a default decision. Through BDUK, the agency charged with delivering Superfast Broadband Britain, DCMS published its invitation to the 7 October talk-fest in a Prior Information Notice (2013/S 189-326234) on OJEU on Saturday 28 September. This gave interested parties just five working days to prepare. As those most interested in the discussion are likely to be living in the most remote, inaccessible parts of the country, i.e. the Final 10% where broadband is slow to non-existent, DCMS may not be expecting a crowd. Some might regard this sudden desire for enlightenment as welcome. After all, some of the 50+ projects that have applied for money from the £20 Rural Community Broadband Fund, run jointly by BDUK and DEFRA, have been stalled for two years. Might this meeting unfreeze that fund? Perhaps not. Hours after it was published it emerged that BT commissioned consultancy Analysys Mason, which spelled out why hiring anyone other than BT might be a “courageous decision”. It did grudgingly suggest that BT would tolerate the locals’ efforts to get connected if they bought their equipment from BT, dug it into the ground and connected it up the homes and hamlets, waived their rights to wayleave income, and donated the resulting network to BT for BT to sell back to them. This is known as the Build and Benefit option, one which Penrith and Borders MP Rory Stewart has promoted and is currently on trial at Fell End in Cumbria. BTW, on 9 May last year BT announced Penrith was the first Cumbrian community to get “superfast broadband”. 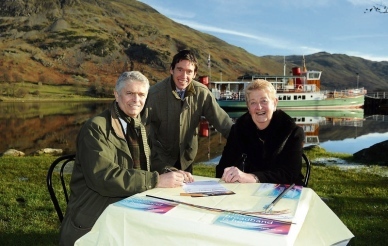 On 29 November 2012 Stewart was present to celebrate the signing of a £40m next generation broadband contract between BT, represented by BT NGA project MD Bill Murphy, and Cumbria County Council’s Elizabeth Mallinson. If readers would like to attend, and they should know space is limited, they should email Andy Carter at bdukf10@culture.gsi.gov.uk or call him on 020 7211 6043 for an invitation.